We tend to go along in life thinking every day is like the next. That’s life right? It’s only when we upset the normal flow of things, like in an emergency, that we realize how unprepared we can be. Take last week for example, I was headed to Orlando for an annual conference. It’s the only time where my family and I are separated for more than 24 hours. I wrote it down for her in case of an emergency (bet you didn’t know Netflix was an emergency). It was at that point, that I realized how unprepared we were for an emergency. Not that the wifi password is a life or death emergency (though my kids would have you believe otherwise). Sure we have life insurance, and wills, but I handled all of it. As the main financial guy, I knew where everything was. But I hadn’t communicated it. Which meant I was the problem. Because if I wasn’t around, the things I was responsible for would be lost. The next morning I bought this, it’s a Legacy Binder aka In case of Emergency Binder. 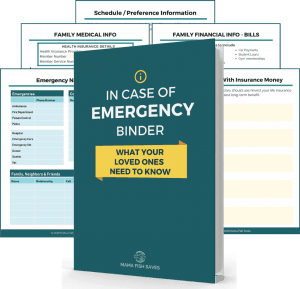 What is a Family Emergency Binder? What Do I Need to Include in My Emergency Binder? Should You Store Your Emergency Binder Online? What else can I include in my Family Emergency Binder? Is this Emergency Binder for Canadians as well? What does the Emergency Binder look like? 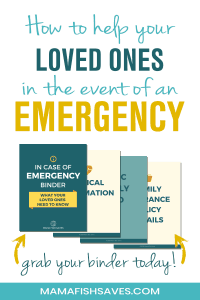 A family emergency binder is everything that your family will need in case of an emergency. It has everything you need. From the basics of contact information, right down to the things that matter most to your family traditions. I like to think of it as an overview to living in your household. An emergency binder is something that anyone can use to get the essentials that they need in an emergency. It’s the bundle of documents that your family will want to have in case something terrible arises. Of course we never want that to happen, but to be prepared for when it does will go a long way to sleeping at night. When you start to think about a legacy binder, or in case of emergency binder, there are a lot of things to consider. Here are some of them. Here you will want to include all family information. Make sure to include medical information, and emergency contacts. In here you should have every relevant phone number and contact. Here you need to include all the essentials for your family insurance details. Any other insurances you might have either personally, or through your work. This is an important aspect that you will likely over look (it’s ok, I did too). Your family is more than just the people who make it up. If you are in the hospital and your in-laws fly in to help, you want your children to be affected as little as possible through this process. Not jolted to someone else’s way of being. What are you kids sports? Where is the team schedule? Who’s the team manager you need to contact? Who are your kids friends? What are their numbers? What does after school look like for your familly? How does supper usually go? What time is the school bus in the morning? A family is more than just the people, it’s a tight knit foundation of little habits and routines. Knowing these can help your family transition easier. Now that you have everything you need to put in your binder, you need a few things. First I would get a good binder to store all your information in a binder and put it some where safe. Personally, I didn’t want to think through every detail so I got this guide to filling out an emergency binder here. It contains all the information in it and walks you through filling it all out. There is quite a lot to think about and it’s all in here. Here are some of the office supplies you will need. When you fill this out document you will want it to be somewhere safe. Personally I had it printed out and stored in our safe. That way it’s easily accessible and simple to get a hold of. I think this is good, because if you have a sitter watching the kids one night, some of the basic information would be nice to take out of the binder, and leave the contact sheet on the counter. You can check out these safes here. I recommend a fireproof and waterproof safe. One last thing about getting a safe, you want it to be heavy duty, if it’s something a person can pick up and run with, then it’s no value to you. This is the one we use, it’s heavy enough that you would need two people to pick it up. If you want to store your emergency binder in the cloud, you can do that, depending on who you give it access to. I would be hesitant to put it there, but I am always worried about someone getting access to it. We printed ours out and stored it in a safe secure place. If you do store it online, use a program that password encrypts it and make sure other people know the password. Personally, I would give the password and file to your next of kin, or caregivers for your children (parents, siblings etc…) Anyone you trust with your information. Give them the password and write it down in a sealed envelop just in case they need it. Anything else you can think of can also go in your legacy binder. If there are other things you want to include like passwords, safety deposit box keys, put them in here. Anything you can think of really should go in here, if you believe your family will need it. That’s why it’s nice to have some dividers with envelopes for your important items. There are few things that are different for Canadians, when it comes to our investments. With the binder I bought, Chelsea has thought about this and has included these in her Emergency Binder. She has things that are Canadian specific as well. Here is a sample of one of the pages from the Emergency binder i bought. I love how organized it is. 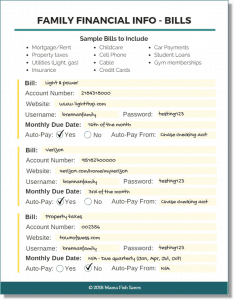 THe form can be filled out on your computer or by hand, if you prefer. Now you have two choices, you can search the internet for hours, wasting your time and hoping you have everything you need in this binder. Or you can do what I did, spend a little bit of money one time, and have this Emergency Binder delivered to your inbox. That way you can get started, and finished, quickly. This was created by my friend Chelsea, over at Mama Fish Saves. It’s comprehensive and amazing resource for families to use in case something unforeseen strikes. She spoke with over 30 families and made sure that she included everything that was nedded for a family when building this. Friends, I know we don’t like to think about the what-ifs in life, but the truth is we need to take care of this. Give yourself a little bit of time, buy the binder like I did and fill it out. If your family ever needs it, they will be happy you took the time. Get the In Case of Emergency Binder by clicking here.